*full disclosure: an online acreener of Beyond Skyline was provided by the film's publicity arm. Cast: Frank Grillo, Bojana Novakovic, Iko Uwais and Pamelyn Chee. It has been seven years since aliens terrorized Los Angeles in Skyline. The original film went onto make millions in theatres. This follow-up, from director Liam O'Donnell, expands on the Skyline universe, exponentially; Beyond Skyline goes worldwide, with this title a co-production between the United States and Asian properties. At least one character returns from the original film. And, all of the events in Skyline and Beyond Skyline occur over the course of 24 to 48 hours. Basically, you could watch both films back to back. This second film is more action focused and lighter on story. This title sets out to be an entertaining spectacle and it accomplishes this goal. There is even a Godzilla (Gojira) fight to finish out the film. Similar to Gareth Edwards' Monsters (2010) and Battle Los Angeles (2011), aliens dominate the cinemascape. But, within Beyond Skyline, there is a pitstop in Vietnam. As well, this second film is broken up into almost two equal parts. This split was set up to likley transfer the film from one production company to another. The result is a worldwide conflict, which will satisfy most science fiction fans. This time, Mark (Frank Grillo) is getting his son out of trouble. Trent (Jonny Weston) has been taken to the local Los Angeles' police station. His son has had a bit of a dust-up. While in the station, a one-man alien is taking over parts of Los Angeles. Angelenos are being scooped up into the sky, for brain harvesting. 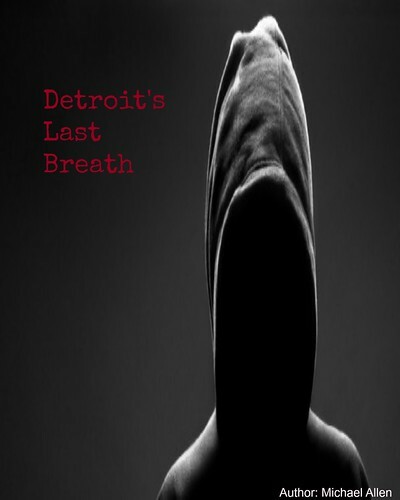 Not much later, Mark and Trent are trapped underground, in a subway system. They gather a few survivors together. But, their escape does not last long. Soon, they are fighting for their lives, in the alien mothership, which crash lands in Vietnam. Still underground, Mark teams up with a Vietnamese resistance group. They find a way to defeat the alien invasion, if they can only just inject the mothership with a human counter-agent. There is a lot going on in this film. A martial arts, action, sci-fi film? Why not (Iko Uwais)? The film is action focused, so the storyline is slightly shallow. It is difficult to develop characters, when they are fighting for their lives. There are a lot of special effects on display, thanks to Hydraulx Entertainment. The Brothers Strause (Colin Strause & Greg Strause) return to the franchise, in a more supporting role in this sequel. Much of Los Angeles is lit up with the alien mothership and various fighters. A scene from the first film returns, involving a nuclear strike. Much of the mothership is destroyed in spectacular fashion. Radiation effects are all but forgotten. Still, aliens show up in various forms: huge alien mechs', smaller scouts and fighters. Many scenes have been enhanced by computer imagery. Meanwhile, martial arts are introduced in the second portion of the film. There is a lot to look at within Beyond Skyline. But, what of the story? This viewer was reminded of a few other past films, while watching this one. Gareth Edwards Monsters and the spectacular Battle Los Angeles could have been influential here. Though, in a podcast at Quiet Earth, director Liam O'Donnell mentions his love for Independence Day (1996). Monsters hosts these huge alien bodies, which inhabit the Earth. The size of the aliens is similar here. Though, the aliens are much more aggressive within Beyond Skyline, compared to Monsters. Within Battle Los Angeles, the aliens have also set their sights on LA. Both films utilize explosive scenes to captivate the audiences. While Battle Los Angeles is more militaristic, this title acts out more like a small insurgency. There are only a few survivors and characters, within Beyond Skyline, to fight back. This viewer can also see how Independence Day has influenced this sequel. The alien attack is very broad in scope. Also, this is no John Carpenter's The Thing (1982), in that this invasion is in-your-face and not occurring below the surface (and in the body). Beyond Skyline wears its science fiction influences very much on-its-sleeve and very much high in the sky. There is only one film element that is slightly troublesome. 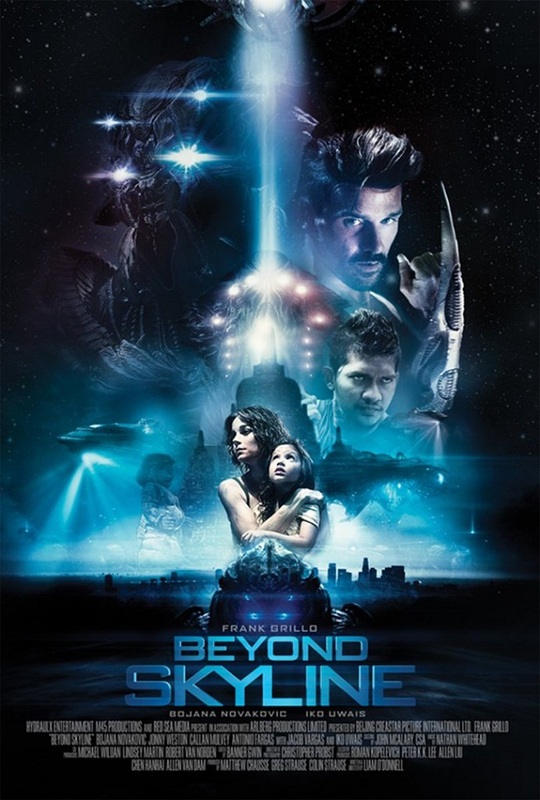 Beyond Skyline is very much two stories in one. It is broken up into two parts: the first story begins in Los Angeles and the second part takes place in Vietnam. The parts are almost equally broken up. While characters and plot points unify the film, Beyond Skyline is clearly fused together, rather than fully integrated. It is like the film is welded together, to account for the global shooting. Parts of this film were shot within Indonesia. The transition from the first story part into the second part is not seamless. But, with all of the action on screen and high tempo pacing, it is hardly noticeable how the film leaves Los Angeles for other, wilder parts. It is unusual to see a film split into two like this. And, this critic can not think of a similar undertaking like this one. As the economy goes global, more and more films will become co-productions, across countries. Beyond Skyline is pure spectacle. The film shoots to bring an entertaining film to audiences and most will enjoy it. It is obvious that director Liam O'Donnell has a love for the sci-fi genre. Slightly broken up in story, it is a bit strange to see so many characters introduced at the halfway mark of the film. Still, this ambitious bridging mostly works as Beyond Skyline moves towards it electrifying, climactic final scenes. The characters are interesting, but they are not well developed. What happens to Mark's alcoholism in the second part? This character flaw is mostly forgotten amongst the many alien beams and explosions. As well, this title is a well produced undertaking. Special effects are almost flawless. However, when a scene is 95% CGI, the film's reality begins to breakdown - a bit. There is no end to the action. 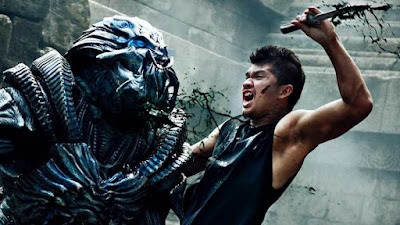 And, Beyond Skyline is an impressive indie sci-fi actioner, which sets the world ablaze (again). Overall: 6.75 out of 10.